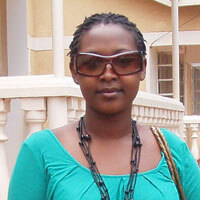 Veroniccah Muwonge was born March 23, 1980 in Kampala, Uganda. She graduated from Makarere University Kampala in 2002 with a Bachelor of Industrial and Fine Arts. She traced discovery of her unfettered passion for art when she joined Makerere Universitys Margaret Trowell School of Industrial & Fine Arts where she graduated with top honours. Her dreams and fantasies have had an impact on her life or people she encounters, whether strangers or friends, and tends to fire up her muse. Every time she comes across a situation or experience that is somewhat intriguing, she wants to capture it on canvas. She worked for over a year at the Nairobi-based GoDown Arts Centre until she left for Kampala. Yet at teenage, Veroniccah was torn between being an altar girl or pursue her love for drawing. But a chance to join Trinity College Nabbingo, in Uganda tilted scales to her pursuit for the arts. And years later paints, brushes and colors now lie at the core of her existence. She was drawn to Pablo Picassos cubist paintings. They immensely inspired her choice of technique, but she managed to formulate her own individuality and style. She also enjoys pencil work, randomly picking out strokes and sharp lines to create outlines of her subjects. She's rarely interested in details, but often prefer, for instance, to capture the pose of a model or subject. She eliminates forms and reflect in a simple way, fascinating themes or ideas. Her pieces also distinctly reflect striking brush strokes, sharply reminiscent of the cubism technique. In spite of supposed similarities, it is unfair to pigeonhole her work in the cubist mold. Veroniccah feels that visual art is most effective as a medium and tool of communication. She captures or interprets experiences and even special moments in her day-to-day social life, through art. Every piece of art that she creates is a bearer of varied messages, which she wishes to convey to the society that she lives in. She even likes to tell stories in most of her paintings and documents life from an artistic viewpoint, whether in context of the past, present or future.